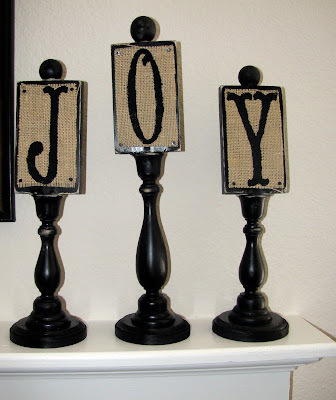 You are here: Home / burlap / Christmas in January! Alright I admit it. I completely failed at a crafty Christmas. Somehow, being out of town for a week over Thanksgiving really put me behind. By the time we got back, unpacked, did the laundry, etc., etc.... I just wanted to enjoy all of our holiday events without a stressful to-do list. I vowed to do my crafty projects AFTER Christmas. And craft I did--all through the first 2 weeks of January. I hit up the after-Christmas sales to buy all my supplies and got some killer deals. It's not a bad way to go. Maybe I'll do this every year! So every day this week, I'll be sharing a Christmas project that I just finished. Be sure the guy at Home Depot who cuts your scrap wood cuts them STRAIGHT! Dare I point out that my "O" is slightly crooked. Oh well, it gives it a little personality, right?! The base is just a wooden circle with a wooden candlestick. Using gorilla glue, I glued those parts together, then glued on the wood piece, a 1 x 4 that was about 6-7 inches long. I just used a wooden circle on top as an accent, although the tutorial used a lovely wooden finial. After gluing all pieces together, I gave it quite a few coats of black spray paint. Then, I roughed up the edges with sand paper for a rustic look. 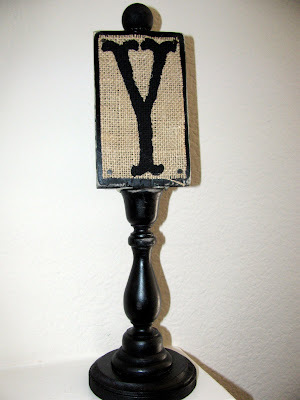 I used my fabulous-new-Cricut-machine to make a stencil and painted the letters onto burlap with black acrylic paint. I used some black carpet tacks to secure the burlap onto the wood. 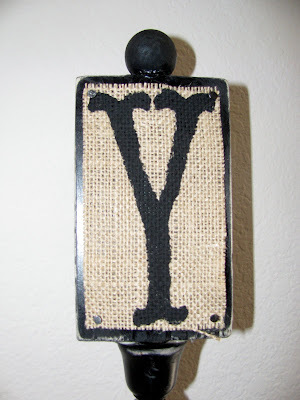 I love the natural look of burlap. ** Be very careful while sanding and applying force to tack in the burlap. I think I re-glued my pieces 2 or 3 times each... and that was using Gorilla Glue, the toughest stuff there is! But that's just another one of my "oopsey's" for ya!